I know it's Friday, but "Workspace Friday" doesn't have the same ring to it as "Workspace Wednesday." Thank you for your tolerance. Today I'm thrilled to take you on a tour inside the workshop of the multi-talented Carm. She doesn't need a last name because her first rhymes with charm. And charming she is. She's 22 years old and recently moved to NYC where she is a full-time live-in nanny to 2 kids. Talk about brave! I completely appreciate Carm's work ethic and dedication to her job, the family she works with and to her craft. She finds a nice balance and really makes her space work effectively. She's so cute, right?! I want to point out a few things. She's smiling. She's knitting (or crocheting- she does both). She has a few projects going at once, spread out on her 'table.' AND SHE HAS MADE SHELVES OUT OF FRESH DIRECT BOXES which is GENIUS in my opinion. Eco-friendly, recycled, repurposed, brilliant. Take a look, they are right behind her. Carm says, "My workspace is a 9'x15' room with no windows. It is also my bedroom, but technically its an office! It is small but cozy." That cozy, warm feeling translates into her work. 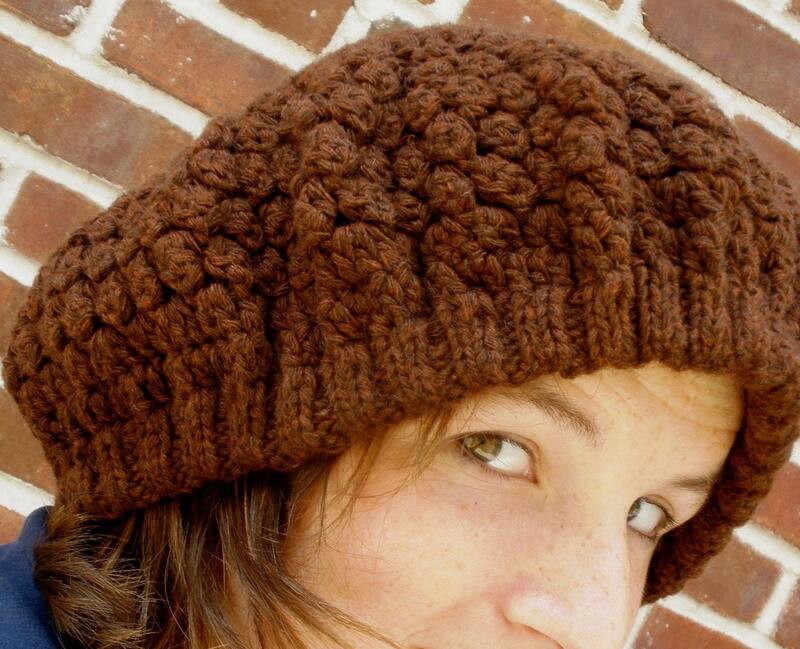 I love this warm and chic hat that she made using merino and yak wool. AND she calls it a tam. It's only $28 in her Etsy shop ProjectsbyCarm. I love the little clothesline made out of paper that is to the right of her chair. Speaking of chair, she told me that it serves as both a chair AND a storage area-- she needs someplace to put everything when she converts her worktable into a bed. Go Carm! I'm totally with you on using every inch of space any way you can. Here's a close up, I personally love the peek into her sketchbook-- can't wait to see those runners when it's all done! And of course she has some bright pink yarn on her desk ready to go with her in a moment's notice. Carm always has 1 or 2 projects in her purse so she can work on them in the subway, or at Whole Foods, or any free moment when waiting for friends. Dedication, dedication, dedication-- this woman is always working! But that's how she creatively fits it all into her schedule and keeps a balance. One more, adorable item from her shop-- I couldn't resist! 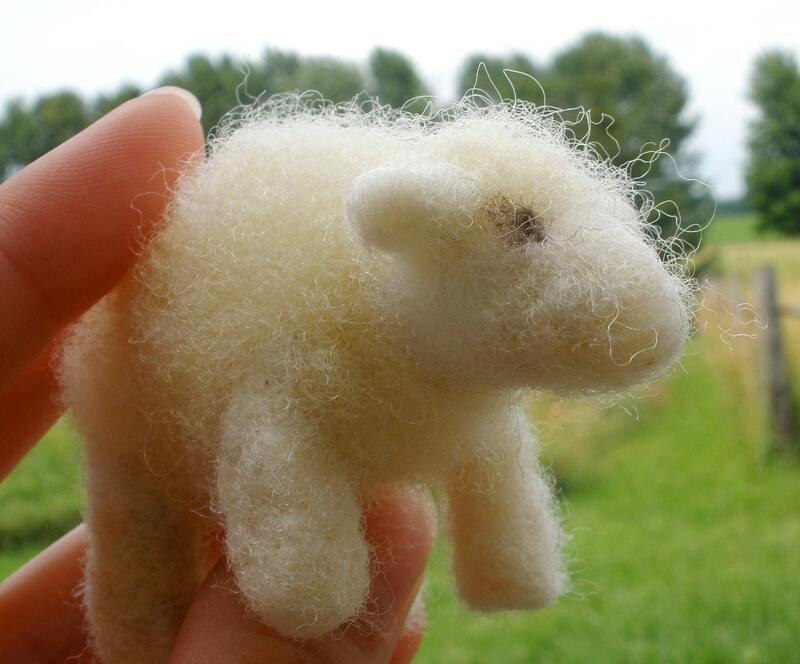 This little sweet hand-felted sheep is available for $13.00 in Carm's Etsy shop. Not only is it ridiculously CUTE but she made it using the wool from her parent's farm in Wisconsin. HOW AWESOME IS CARM?! Well, that wraps up this week's look into a real New Yorker's art and craft space. Thank you Carm for opening your workspace and home for us to peek into. You rock! I love Carm's hand felted sheep. Oh and that Fresh Direct shelving unit - now that's what I call recycling....or is that upcycling? Thanks so much for telling us about this talented artist! This is great! Reminds me of when I first got to NYC...my "studio" was a 9x6 foot room that had my bed, a table, sewing machine and rubber tubs from Target that served as my "cutting table." I know from experience that you don't need tons of space or a glamorous professional studio to churn out beautiful work...and Carm's lovely creations are testimony to this! Thanks for the feature Stephanie..and for everyone's kind comments! If you want a sneak peek you can check out my blog!